Nothing too out of the ordinary is expected over the next several days. More shower and thunderstorm action will be around to end the week and, of course, storms this time of the year can easily drop a quick inch of rain and produce frequent lightning. Showers and thunderstorms affected just a little more of the area than expected on Tuesday, but overall not a bad forecast. 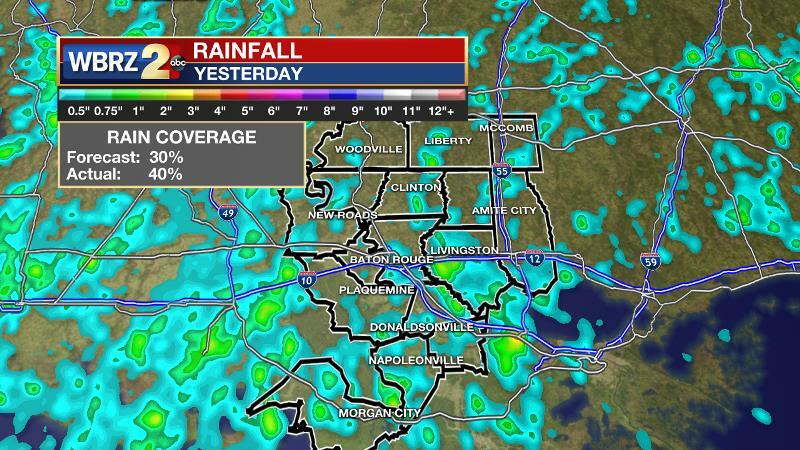 The rainfall winners appeared to be eastern Ascension and western Livingston Parishes. Today and Tonight: Wednesday should run off weather similar to Tuesday with fast warming into the low 90s by early afternoon. 93 degrees should be met by 2 or 3pm. Light, southeast winds and high humidity will result in feels-like temperatures over 100 degrees for a few hours. Skies will be partly sunny followed by isolated showers and thunderstorms. Nighttime lows will stop in the mid 70s. Up Next: Some changes come to end the week. Thursday through Saturday will have a less stable atmosphere over Louisiana with the result being scattered afternoon showers and thunderstorms. More rain and cloud coverage in the afternoon may serve to stop high temperatures just shy of average for the time of year, which is 93 degrees. The next relatively drier trend will come early next week. The Tropics: While the Gulf of Mexico and Caribbean Sea remain hot but quiet, Tropical Storm Debby barely qualifies the central Atlantic as active. The storm has 45mph winds and will drift north and eventually dissipate over open water by Friday. The Eastern Pacific is very active right now with three named storms churning. 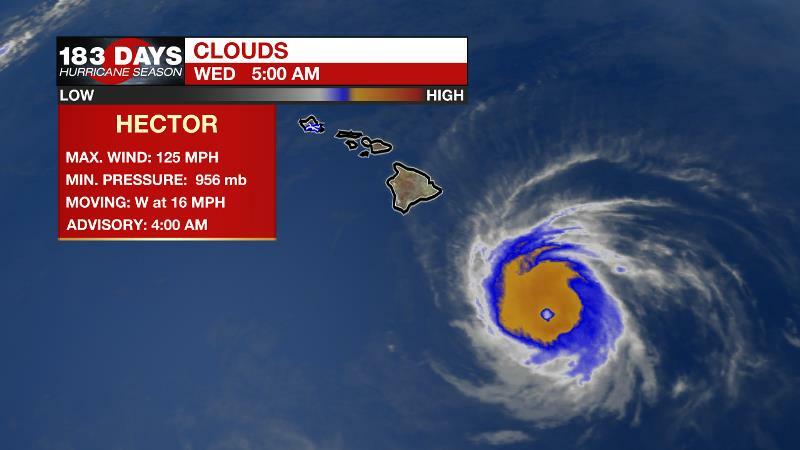 Hurricane Hector is a dangerous storm that is expected to pass just south of Hawaii’s Big Island causing high surf and wind. Hurricane John and Tropical Storm Kristy will all continue westward into open water. In an unusual weather event, the former Tropical Storm Ileana was absorbed by John on Tuesday. Surface high pressure in the Eastern U.S. will continue to provide onshore flow, which will translate into ample humidity. A broad upper-level ridge will begin to break down over the Lower Mississippi River Valley as a trough starts to dig into the Southeast. By Thursday, the surface high will weaken and press east and the deepening trough will increase instability locally. This alone will be enough to generate increased convection from midday onward into evening. Additionally, any disturbances riding through the northwest flow aloft may result in an additional uptick in activity, possible even some nighttime showers and thunderstorms. However, forecast models do not yet depict any particular impulse that could point to such an increase. We will likely just need to monitor daily trends for these weak and subtle disturbances.